This comprehensive textbook, now in its sixth edition, combines classical and matrix-based methods of structural analysis and develops them concurrently. New solved examples and problems have been added, giving over 140 worked examples and more than 400 problems with answers. 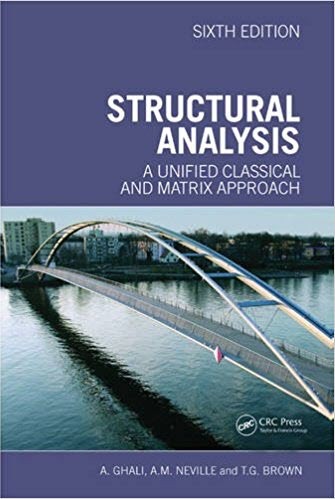 The introductory chapter on structural analysis modelling gives a good grounding to the beginner, showing how structures can be modelled as beams, plane or space frames and trusses, plane grids or assemblages of finite element. Idealization of loads, anticipated deformations, deflected shapes and bending moment diagrams are presented. Readers are also shown how to idealize real three-dimensional structures into simplified models that can be analyzed with little or no calculation, or with more involved calculations using computers. Dynamic analysis, essential for structures subject to seismic ground motion, is further developed in this edition and in a code-neutral manner. The topic of structural reliability analysis is discussed in a new chapter. Translated into six languages, this textbook is of considerable international renown, and is widely recommended by many civil and structural engineering lecturers to their students because of its clear and thorough style and content.